Okay, first..I too have to restrain the tears that are puddling in my eyes. But I don't want to because that emotion is so real. What a courageous young man Noal is to step up and protect his sister in front of his peers. Furthermore, what an exceptional example he is for other children even at such a young age. Already he has challenged her position with his words and actions, something adults struggle with. I can only imagine he has inherited such love and affection for his sister by watching the love you and your husband pour out to Pip. We lead our children by example. My prayer is that Noal continues to be a leader in setting the example by just being true to himself through his love and concern for his sister and others. I also pray that the little girl has an opportunity to share her experience with an adult who can offer her clarity in knowing that every individual is valued and it is inappropriate to dismiss someone's beauty and value with the comments that she made. She is a child and with every child there are growth opportunities. I pray this opportunity is used to turn one heart towards the acceptance of others despite how they look. You are a wonderful mama Tara and I have hope that you will find the strength to use this experience as a celebration of Noal's courage and an awareness of the strength Pip will have growing up with a mama who will give her words of strength and encouragement for the times when you will not be able to be there with her. She is so beautiful!! Five year olds have made me cry for much less. And what an awesome little hero you have. Such a lucky momma to have such two beautiful children inside and out! She's is so beautiful!!! Such a lucky momma to have two beautiful children on your hands inside and out!! And I want to let you know that a five year old has made me cry for much less. After my son Aaron was born and diagnosed with DS I had a very difficult time adjusting. I talked to a number of parents that were raising children with DS and was completely shocked that more than one even saw this in some way a blessing! At the time I could not possibly fathom that I would ever feel anything positive would come from the diagnosis. I'm humbled by what I've learned in the last four years; by the people that I've met, the photos of beautiful families that I've seen, and the blogs that I read. Today if I were to talk to a new parent about DS, I don't think I would use the world blessing- only because it's difficult to comprehend at first. Now I hear or see those blessings often in pictures or posts like the one above. At such a young age not only has Noel has already learned to see past any differences to the beautiful soul within others, he encourages those around him to do the same. The world is a better place with "The Happy Soul" and family in it. Oh Tara- you never have to worry about your little Pip with a brother like that around- that is so amazing that he has that level of instinct and sensitivity and protectiveness at such a young age! Your two little children are already making this world a better place. I read your post this morning and have been thinking about it ever since. First of all as everyone else has said WAY TO GO BIG BRO!!! He will lead by example and be such a great big brother in the years to come!! Why I wanted to comment is because I work with special needs children as an EA (this could mean DS or Autism or behaviours or many many other things) and in my time as an EA I have seen such LOVE and acceptance for these children by their peers....something that our generation (and those before us) may not have been accustom to. Especially up into the high school years I watch these children be a huge part of their high school population and it just makes me happy to know this acceptance will only help them to succeed in life more so!! I can't seem to get my words out right but my point is that if somehow, someway this generation has learned to treat children with special needs as their equals we will live in a better place...and little girls like that will hopefully learn from her peers as she grows. Tears filled my eyes for you...Noal, what a beautiful, sweet, precious and compassionate little man you have there. His honor and protectiveness poured out in every way there. I owe that to the beautiful and loving parents that you are. Pip, sweet Pip, such a beautiful and innocent lil angel. She will endure many things in life, as will my son Jadon. However, she will come through each and every thing that comes her way. Look at all she has overcome so far! That little 5 year old was only doing, as you said, being a little girl. This is why I always stress that as parents, it is our duty to explain to our children that not one person is the same. That there are different people out there, who will look differently then us, but that does not mean that their feelings are different. We do not say mean things to them, we should always see the beauty in another person. But that is my insight and in a perfect world, that would be great. What I do know is, that you have a beautiful family. You are doing an amazing job. You all have beautiful and happy souls. I too worry about what the future hold down the road with Jadon, and when I will encounter the same situations, and how I will react to it. Until then, I will continue to do what I am doing, and that is raise my beautiful boy into an even more amazing lil man :) Tara- thank you for sharing your life with us. You truly are amazing! You can definitely tell that they are being raised to be amazing people. Pip is a true happy soul and Noal is the sweetest of protectors. He is an amazing big brother. I wish other people would teach their children acceptance and understanding, especially at a young age. Thank you for sharing! She's adorable!!! I'm new to this journey (only 4 months in), so I can only pray that my son will be as protective of his sister as yours is. I totally have been there! Its amazing to think that little 3,4 and 5 year old kids can make me ball like a little kid but it does hurt. I think it hurts even more when their parents don't step in and just stand by and watch. BIG hug for you tonight! this story gives me a lump in my throat. my little 4 year old is watching me read this and it just spurred a great conversation about feelings which concluded in us both agreeing that your little pip is beautiful. And your son is too!! I have a seven year old boy, Noa. He is such a darling and so good. He has learned that he needs to sit quietly in meetings and not disturb, ( as a single parent I sometimes need to take him with me), he has beautiful manners and can behave but he also has a lot of fun. he is extremely active and full of life and wonder. When I get complimented about his good behaviour I sometimes get put down by someone who's children are not as well behaved and are unruly. Blah blah. oh by the way he was born with an extra chromosome and is loved so very much and makes me the courageous mother that I am. Oh my goodness. I was just telling my son earlier today that I was grateful I didn't have a special needs child because I'd want them to be protected at home their whole life because people can be so cruel... But that isn't a life at all. Praise God Pip has you as her family, you're doing an amazing job! I love seeing her sweet face each and every day, Noal too! She is perfect. The comment is so innocent, but it still irks me. The Developmentally Delayed class is two doors down from my classroom. From the first day I make sure my students know how special those kids are to me. Nothing makes me more happy and proud than the first day I hear my students say, "I just played with _____ today. They are the best!". It happens every year. My students, many have never met anyone "exceptional", see that they are no different than the kids down the hall. Then, you top it all off with, "My'heart! My'Heart! I missed you this weekend!". I have the best last name and will miss my little soon-to-be grade 8 graduate (with Down Syndrome) greeting me every morning. Mrs.Hart has never, and will never, mean more. Thank you so much for your blog. 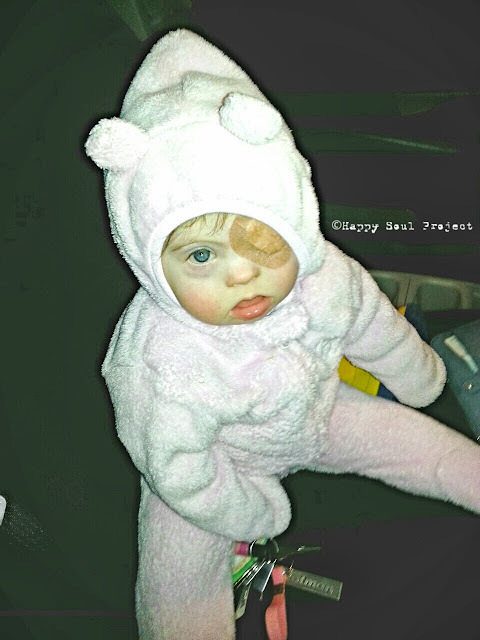 Your family is absolutely amazing and that little Pip and Noal will change the world! Having a cousin with down syndrome, I really appreciate your amazing message. She is the most amazing little girl and brings an exuberant amount of joy to everyone who is fortunate enough to meet her. She like PIp wears an eye patch and pink glasses! So thank you for your inspiring message... hopefully someday everyone can realize "what makes you different, makes you beautiful" You're awesome PIp! Bawling. I love your son.